Small museum in Fitzrovia, crammed full of vintage toys. The museum was established in 1956 by Marguerite Fawdry, who had recently opened a small shop selling backdrops and other components of toy theatres. The initial stock for the shop was purchased as a job lot comprising the remaining stock from the last of the Victorian toy theatre print companies, Benjamin Pollock Ltd — and so when Marguerite decided to add a museum to her shop, she named it Pollock's Toy Museum. 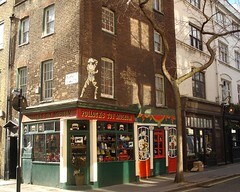 Initially located in Covent Garden, the shop and museum moved to Fitzrovia in 1969, and are currently run by Marguerite's grandson. The premises are split between two houses, one built in the 1880s and the other in the 1780s; the route through the museum passes up the staircase of one and then through into and down the staircase of the other. No space is wasted, with toys displayed not only in the rooms of the houses but up and down the staircases too. The first room, on the first floor just up the staircase from the tiny entryway, features optical toys, model trains, building toys such as Meccano and Bayko, and space toys including a Stingray gun (as the information leaflet points out, some of these date from the 1940s, well before the first human spaceflight). The room on the next floor up harks back to the origins of the museum, with a display of toy theatres from around the world. The trail now leads into the second house, which is dominated by dolls, dollhouses, and other doll-like toys, including the world's oldest teddy bear ("born" in 1905). Information about the toys is provided as typewritten paragraphs attached to the walls, propped inside the cases, and pasted to little handheld boards. The displays can be a little frustrating at times; everything is inside glass cases, and not always as easy to view as might be optimal. However, for those born in the '60s or earlier, there's plenty of nostalgia-based entertainment to be had here (Kake's parents have given it their seal of approval). An hour or so is plenty of time to allow for a visit, though you may want to spend some time in the ground floor shop as well. Last visited by Kake and family, October 2011. Opening hours taken from the Pollock's Toy Museum website, February 2019. Last edited 2019-02-05 20:23:31 (version 8; diff). List all versions. Page last edited 2019-02-05 20:23:31 (version 8).